Click the image to enlarge and view the gallery. In one of his earliest visits to Virginia as a public figure, Dr. King delivered his talk, “The Montgomery Story,” at Hampton Institute. En route to Hampton that morning King had been refused service in the main dining room of the Atlanta airport's restaurant, and had his first meal of the day after his talk. Dr. King visited Williamsburg to address an overflow crowd at First Baptist Church on Scotland Street. 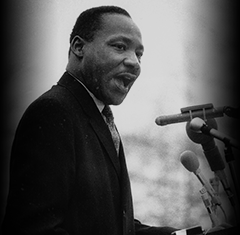 Returning to Newport News for the Southern Christian Leadership Conference Fund for Freedom Drive, Dr. King spoke to an audience of 700 at First Baptist Church. 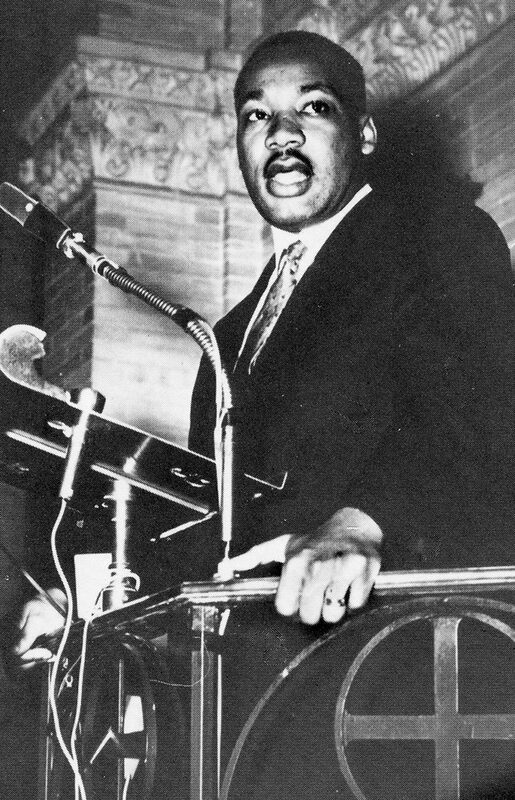 At a rally held by the Southern Christian Leadership Conference, Dr. King gave a press conference at Union Hall on East Washington Street and a talk at Peanut Park. 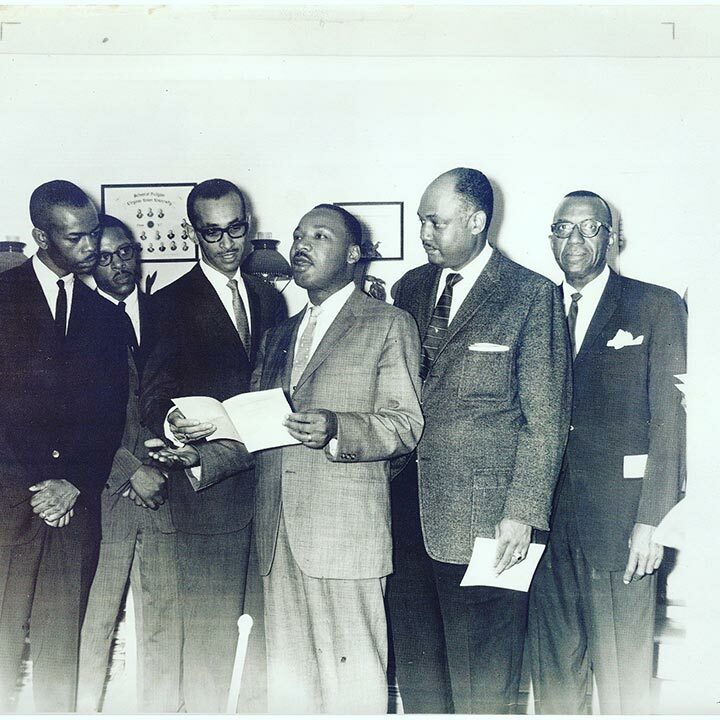 In what was described as a “whirlwind visit,” Dr. King attended the installation services of Dr. Milton A. Reid at New Calvary Baptist Church, followed by a press conference with reporters and Norfolk State College students. To encourage participation at the Poor People's March on Washington, Dr. King intended to visit Norfolk, Suffolk, and several locations in Southside but cancelled to go to Memphis in support of a sanitation workers' strike. 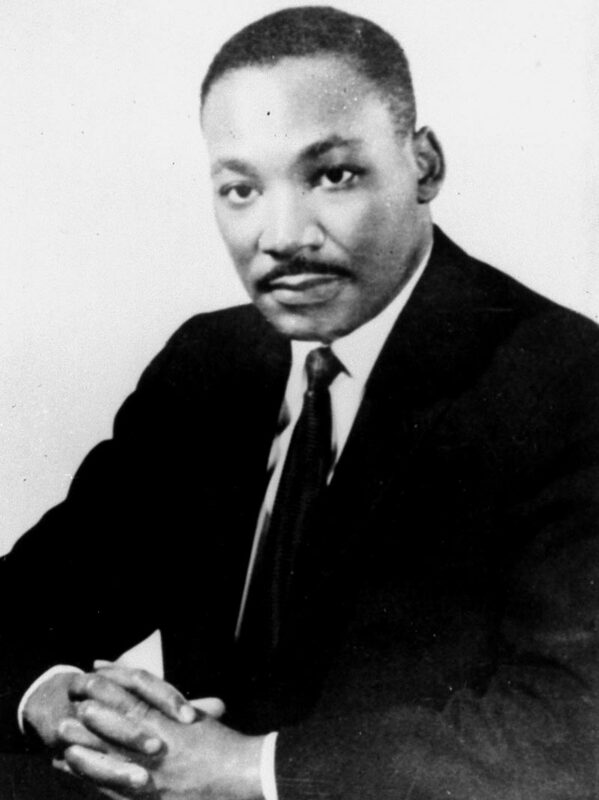 In Memphis, on April 4, Dr. King was assassinated on the balcony of his motel. On June 6, 2018, the Virginia Dr. Martin Luther King, Jr. Memorial Commission held a Beloved Community Conversation at First Baptist Church on Scotland Street in Williamsburg, where Dr. King had spoken 55 years before, reflecting on Dr. King's time in Williamsburg and asking, "Where do we go from here?" The discussion featured remarks from Col. Lafayette Jones, who was present for Dr. King's visit to First Baptist Church. Featuring speakers and panelists Reverend Reginald Davis of First Baptist Church; Reverend Christopher Epperson of Bruton Parish Episcopal Church; COL Lafayette Jones of the James City County Historical Commission; Senator Monty Mason, First District of Virginia; Brian J. Smalls, President of the York-James City-Williamsburg Branch NAACP; and Dr. Robert Vinson, Associate Professor of History & Africana Studies, William & Mary. Moderated by Commission Chair Senator Jennifer McClellan. On July 24, 2018, the Commission held a Beloved Community Conversation in Suffolk at the Suffolk Center for Cultural Arts, fifty-five years after Dr. King visited Union Hall and Peanut Park in Suffolk. Mrs. Ruby Walden and Bishop James Johnson were present for Dr. King's visit and gave their firsthand accounts. Featuring speakers and panelists Delegate Cliff Hayes, 77th District; Helivi Holland, City Attorney, City of Suffolk; Bishop James Johnson, Hill Street Worship Center, Inc.; Mayor Linda T. Johnson, City of Suffolk; Ruby Walden, Civic and Community Leader; and Dr. Felton Whitfield, District Superintendent and Pastor. Moderated by Commission Chair Senator Jennifer L. McClellan. On September 26, 2018, a Beloved Community Conversation was held at Hampton University in Hampton, which Dr. King had visited in 1956 and in 1962. Dr. Sharon Campbell Waters, who attended Dexter Avenue Baptist Church during Dr. King's tenure, gave an account of her memories of Dr. King. Featuring speakers and panelists Dr. William Harvey, President, Hampton University; Councilman Steve Brown, City of Hampton; Gaylene Kanoyton, President, Hampton Branch NAACP; Senator Mamie Locke, Second District of Virginia; Attorney Carter Phillips, Hampton Unity Commission; Rev. Dr. Calvin Sydnor, III, African Methodist Episcopal Church; Aman Tune, Political Science Major, Hampton University; Delegate Jeion Ward, 92nd District of Virginia; Dr. Sharon Campbell Waters, President and CEO of Innovative Grant Concepts, Inc.; Robert Watson, Assistant Professor of History, Hampton University. Moderated by Commission Chair Senator Jennifer L. McClellan. The Commission held a Beloved Community Conversation in Newport News on October 23, 2018, at First Church of Newport News Baptist. 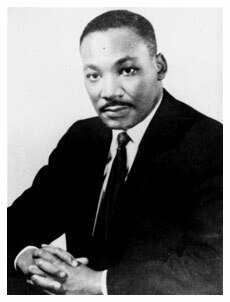 Dr. King had visited First Baptist Church of Newport News (now First Church) in 1958 and again in 1962. Dr. Timothy Tee Boddie, whose father was pastor of First Baptist Church when Dr. King visited, described his family's connection to Dr. King. Featuring speakers and panelists Dr. Timothy Tee Boddie, General Secretary, Progressive National Baptist Convention; Jeremiah Edwards, President, Hampton University NAACP; Reverend Rodney Johnson, Pastor, First Church of Newport News; Amere Langley, Senior, Denbigh High School; Senator Mamie Locke, Second District of Virginia; Queen Esther Marrow, Singer, Actress, and Civil Rights Activist; Dr. Mario Mazzarella, Professor Emeritus of History, Christopher Newport University; Senator Jennifer McClellan, Chair of the Commission; Delegate Marcia Price, 95th District of Virginia; and Andrew Shannon, President, SCLC Peninsula Chapter. Moderated by Commission Chair Senator Jennifer L. McClellan. On October 30, 2018, the Commission held its last Hampton Roads Beloved Community Conversation at New Calvary Baptist Church in Norfolk. Dr. King visited the church on October 29, 1966, to attend the installation services of Dr. Milton A. Reid. Marian Reid, Dr. Reid's wife, described her memories of Dr. King at the Beloved Community Conversation. Featuring speakers and panelists Mayor Kenneth C. Alexander, City of Norfolk; Fr. James Curran, Basilica of Saint Mary of the Immaculate Conception; Joe Dillard, President, Norfolk Branch NAACP; Delegate Jay Jones, 89th District; Delegate Joe Lindsey, 90th District; Dr. Cassandra Newby-Alexander, Norfolk State University; Marian Reid, witness to Dr. King's time in Norfolk; and Rev. Dr. William Marcus Small, New Calvary Baptist Church. Moderated by Commission Chair Senator Jennifer L. McClellan. © 2011-2019 Commonwealth of Virginia, Dr. Martin Luther King Jr. Memorial Commission. All rights reserved. Designed and developed by the Division of Legislative Automated Systems .